DBIA is proud to announce the three finalists in the 2018 National Design-Build Student Competition. 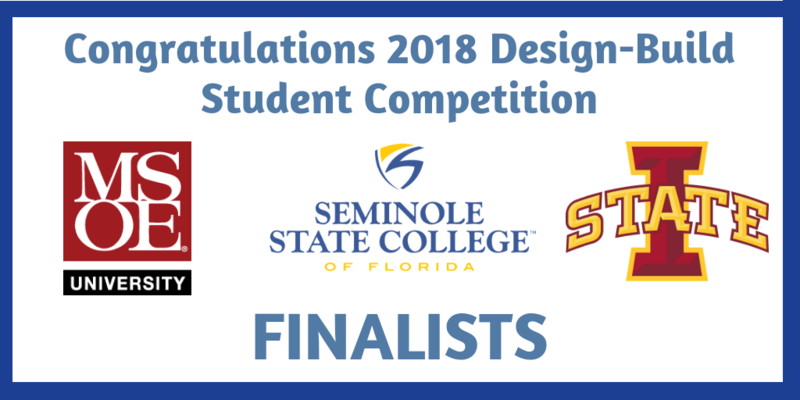 Student teams from the Milwaukee School of Engineering, Seminole State College of Florida and Iowa State University will advance to the final round of the competition. The three student finalist teams will compete in front of a live jury and audience at DBIA’s upcoming Design-Build Conference & Expo on November 8 in New Orleans. The teams will take questions from a panel of industry interviewers about their design and construction plans for a 2-3 floor student resident hall on an American college campus. The competition began at the regional level with 36 teams of students from 27 universities from across the country competing. Nine regional winners were selected to compete in the second phase of the competition based on their response to the initial RFQ. An RFP was then issued to those nine and the top three finalists were selected based on their responses. The winner will be announced live at DBIA’s Design-Build Conference & Expo in New Orleans on November 9.